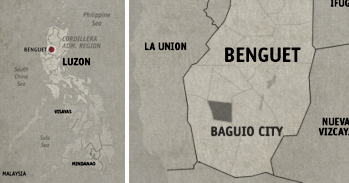 I know I’ve been saying how I’ve been visiting Baguio City countless of times, but I’ll say it again—but this time, with a twist. 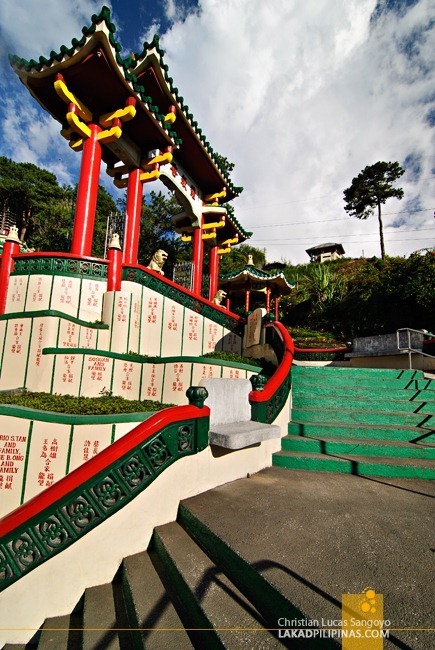 I’ve been to Baguio City countless of times but I have never ever been to one of its more famous tourist attractions, the distinctly Chinese, Bell Church. Now I really don’t know why I’ve never even stepped foot at the gates of this temple. It may probably be due to it’s out of the way location, which is, by the way, literally just a hop away from the city limits. Or maybe I was just not interested—watching people while having a cheap cup of coffee at Burnham Park has always been enough for me while in Baguio. The only reason I entered the Bell Church really was that the jeep I was riding en route to the Strawberry Farm passed its gate. Ah so that’s where that Chinese temple is located, I thought to myself. Somehow it got me all curious, so I went back to the area that very same afternoon. Now why Bell Church? I’m really not seeing huge bells around, the only ones I noticed were the few regular-sized ones topping the temple’s many red, yellow, and green gates. And church? I’ve read that this is a prim and proper Taoist Temple. I’m guessing the local moniker stuck since Bell Church is easier to remember than Taoist Temple and besides, it’s two syllables less than its proper name. 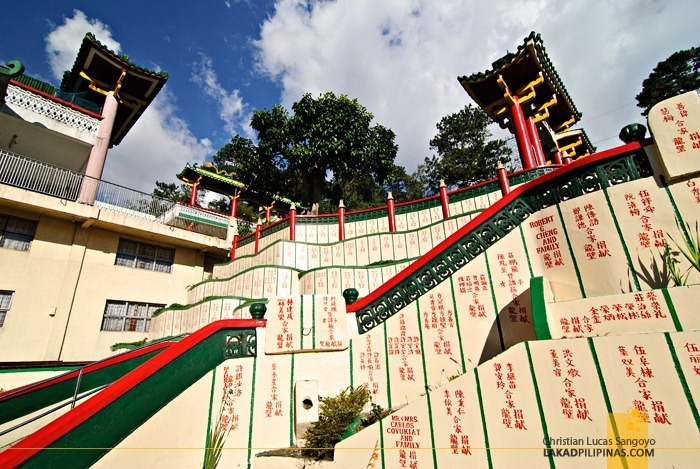 The first thing I noticed as I entered the temple was the concrete stairs with undulating walls. Right along it were Chinese inscriptions. I have no idea what they represent but after seeing a few written in western words alongside, I’m thinking they might be names. Now names of what, Donors? Possibly. 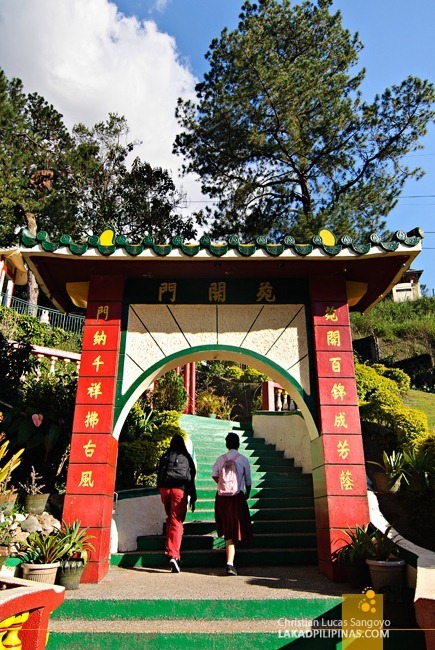 The pathways leading to the temple above the hill are littered with all sorts of Chinese markings, green-scaled dragons, and lions. 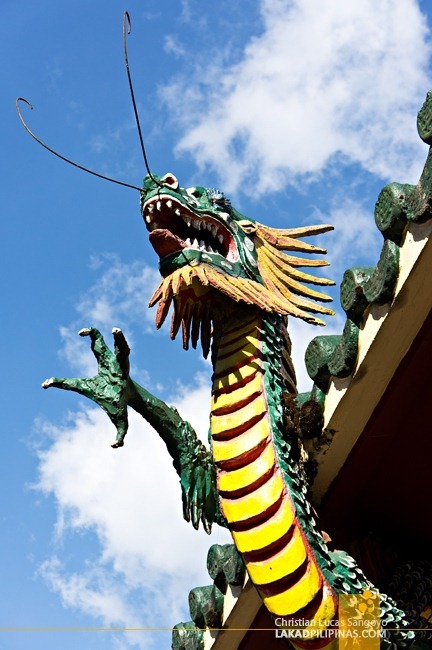 If I counted correctly, I passed not less than four ornate paifangs or Chinese gates before reaching the main temple. 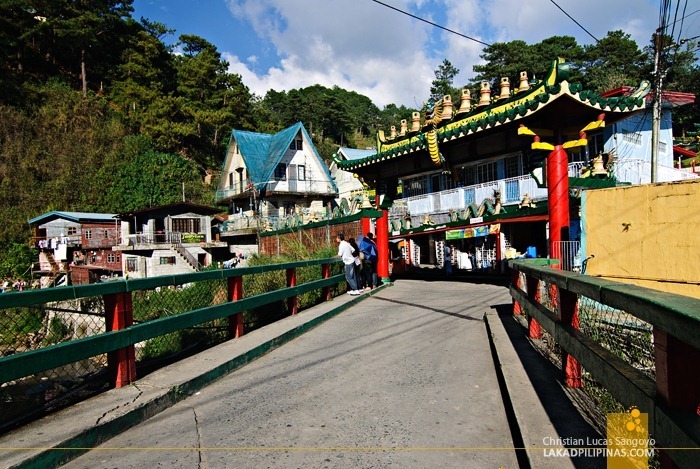 I’m almost convinced I’m not in Baguio City if not for the cool weather. 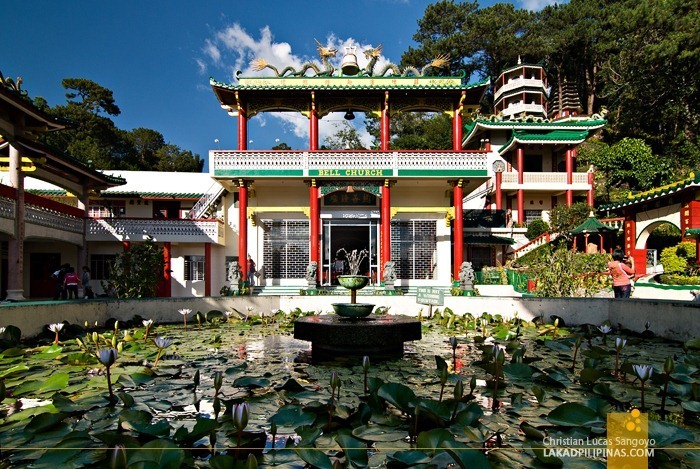 A lotus pond, also used as some sort of wishing well, is situated at the center of the court fronting the temple. Unfortunately, photographs are not allowed inside the main “church” so I didn’t enter its premises anymore. Besides, I’m not really sure if curious travelers are even allowed to go in. There were a few students and tourists inside the grounds; I guess Bell Church isn’t really as popular as I thought it to be. But to be honest, I liked it better that way, less people, less noise; quieter time alone. This is a temple after all and people cheekily posing in front of the cameras seemed ill fit and mildly disrespectful to the place. 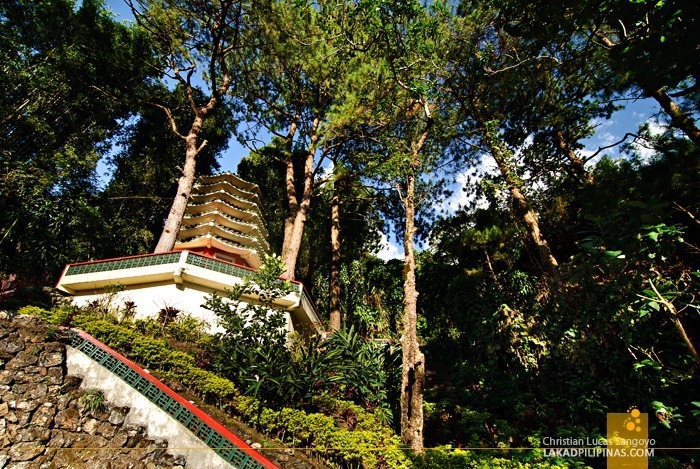 Multi-tiered pagodas dot the hills surrounding the area. I love how they seemed to mimic the towering trees they stand side by side with. It all seemed very mysterious and eastern-like to me. Very Crouching Tiger Hidden Dragon, as Westerners would probably say. 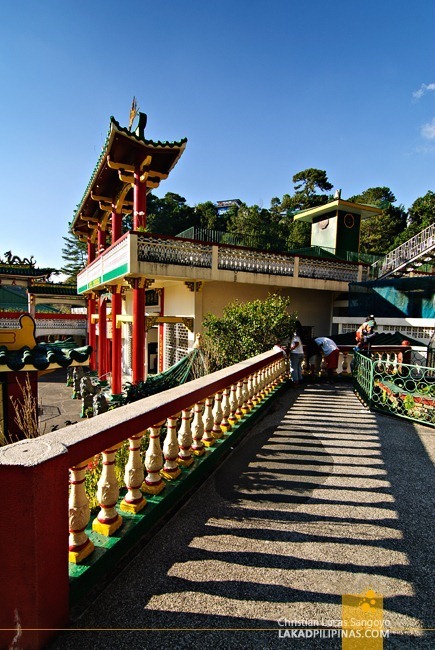 The central patio has a panoramic view of the surrounding area, and as the sun readied to set, I started romanticizing how mesmerizingly beautiful the Bell Church is gonna look with its proud red and green gates, its ornate buildings, its soaring pagodas, and lush old trees. It’s the perfect romantic location with a partner in tow. I hazily walked around and saw a signboard haphazardly posted along the grass. Bawal mag-date dito (No Dating Allowed). Oh well, I guess I have to remind myself too, this is a temple after all. Christian, ganda nung last pic... nakapa-panoramic at yung timing ng sun sa right side - simply gorgeous shot! 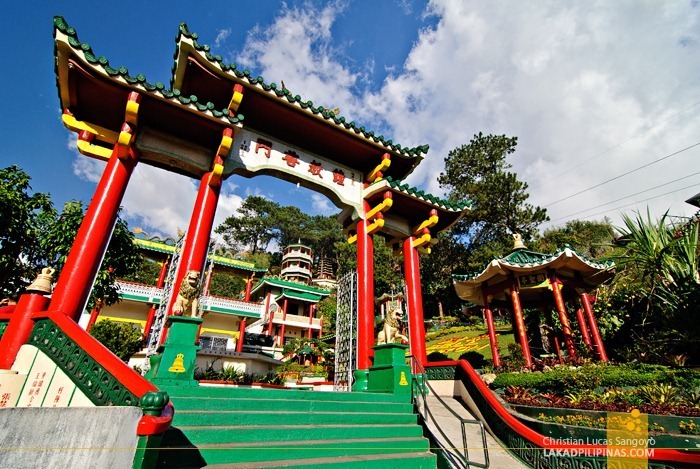 it's much much vibrant from what i remembered it to be.. but then, i last visited it when i was a kid.. :) nice shots..
Kala ko Taoist Temple sa Cebu eh.